The Actor Profiler works in tandem with the Issue Crawler. It calculates the top ten actors on an Issue Crawler map, and profiles each of them. The profile consists of each actor's inlinks and outlinks. 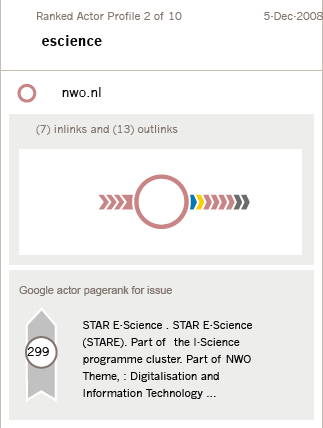 The Actor Profiler also shows the Google ranking for the actor for a specified issue, normally the subject matter of the issue network or any other issue the user chooses.